Since 2008, a new Government framework for learning, development and care was introduced – The Early Years Foundation Stage. The aim is to ensure that every child is given the opportunity to learn through play to the best of their ability. We have a fantastic range of toys and equipment for all ages and a lovely peaceful library area. We have a large interactive white board in the hall way which is used by all the children to enhance their learning experience. Touch screen laptops are also a valuable addition to aid their learning. 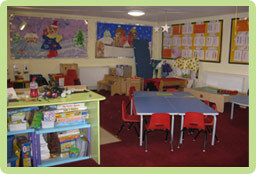 All staff are level three trained in Childcare. Our Manager Susanne has attained a Foundation Degree in Early years Education, BA Hons degree in Early Years Care and Education and has Early Years Professional Status (EYPS). The Proprietor Maureen, has a BA Hons degree in Childhood and Youth Studies. Our Deputy Manager Tash has gained a Foundation Degree in Early Childhood Studies. All staff are first aid trained and have attended Child Protection training and hold basic Food Hygiene certificates. Children learn by themselves and also with friends through play and we offer a play-based curriculum which supports all aspects of learning. Each room offers experiences suitable for the age group and individual child and each day offers a different and exciting journey. We observe the children by using an electronic learning book to capture their actions and track their progress which can be viewed by parents via the internet. This system will take effect from September 2016. 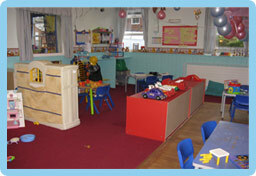 Friendly, highly trained staff, focussed on providing fun and learning to help your child feel secure and confident. 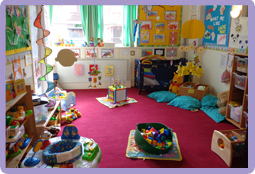 Fully equipped rooms with a quiet area and messy play section enabling the children to develop through exciting opportunities and experiences. Fantastic secure outside play area offering free-flow inside/outside access for all the rooms. Home cooked food freshly prepared daily by our trained chef, Helen. All dietary needs are catered for including vegetarian, dairy free and food allergies. We are very lucky to be able to provide secure, inside/outside access for all children including babies directly from each room. 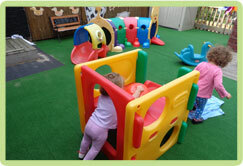 The toddler and baby rooms have a raised decked area covered in artificial grass full of equipment and toys and the electric sun canopy protects them from the sun and rain. 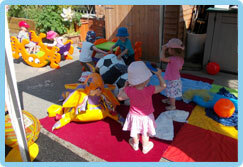 We provide waterproofs so all babies and children can enjoy outside play whatever the weather. 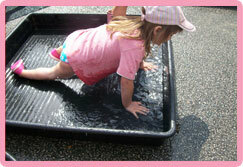 Playing in different weather conditions increases the opportunities for your child. For the older children we have bikes and trikes, numerous toys, playhouses and lots of small items including balls, hoops and bean bags to increase their skills and concentration. The children are able to access the outside play equipment themselves. 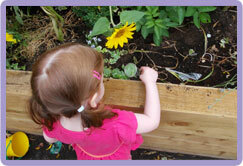 Our outside woodland area gives hours of fun and the children enjoy planting bulbs and growing vegetables.